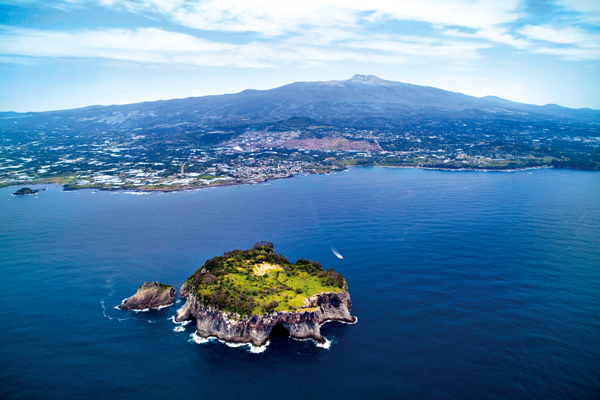 This article originally appeared in a special edition for the 2014 Asia Cruise Forum Jeju. The history of Tamna, the first known civilization to arise on Jeju, is still a mystery. When compared to the Mediterranean, Tamna might seem culturally peripheral, yet this does not mean it was isolated and remote. Even the islands of Polynesia, some of which are separated by thousands of kilometers, are not alone and have rich histories of cultural exchange with other regions. However, our understanding of Tamna culture is limited by the historical record, written from the perspective of Seoul and even China. With substantive truths hard to establish, historical revisionism is in order to restore Jeju’s history from the perspective of this island and its people. The pathways of maritime civilization were since time immemorial defined by the winds. Without wind power, voyages between cultures and peoples would have been impossible and the seeds of culture, civilization and even nature would not have crossed the seas. Was the cultural flow really always from the mainland north to the south? Is it possible that culture also arose in the south, following ocean currents northward? By viewing maritime history as an exchange along ocean currents, we can challenge hegemonic and peninsula-centric worldviews which overlook Jeju’s true role. Jeju’s maritime vistas are not just sleepy horizons, but wild seas powered by the Kuroshio Current. In midwinter, the seas around Jeju, Kyushu, Ulleung-do and Dokdo are colored red with the current’s warmth, showing it fervently alive. In ascertaining the maritime role of Tamna and Jeju it is crucial to first identify the castellan. The castellan must have been someone with great navigational and shipbuilding skills to reach and control the island. These are normally assumed to have descended from the mainland in the period of the Three Kingdoms, vying for power with China and Japan. However, when we view Tamna and Jeju as an historically maritime culture, we can see it as an independent island of the Northwest Pacific, not as the property of mainland Korea or any other surrounding power. There are differences in how mainlanders and locals view Jeju’s history. Tamna disappeared from view after its collapse and receives little mention in Korean history books. However, while under Yuan rule (the successor dynasty to the Mongols), Jeju was centrally important and a control tower. The obscuring of Tamna history is not a mistake. In the hegemonic formation of the modern state, a centralized conception of nationhood was needed and minority and peripheral views were excluded. Although East Asian history is rich and diverse, it has prioritized the views of those at the center, undervaluing the periphery. As such, people are coming to see that a Jeju perspective is essential to truly understand Korean history, and it is the same for Taiwan in Chinese history, and Ryukyu in Japanese history. If we look at history from a Taiwan-Ryukyu-Jeju perspective, separate from Chinese, Japanese or Korean hegemony, we can realize a new perspective on the region’s maritime history. In the 21st century there has been a paradigm change toward the ocean as it is again brought to the fore with the growth in marine tourism, again shifting Korean eyes to its coasts and islands, and Jeju is leading this charge. Jeju has unique strengths in this area such as in marinas, fishing, festivals, yachting, cruising and, of course, its marine cultural heritage. Perhaps we could call Jeju the black pearl of the Northwest Pacific, or even the black coral. Jeju is not only a traditional island, but a modern province leading the drive into the future. It is also a tourism hub, and a national leader in ecological projects and strategy. In carefully managing these roles, more and more people will come to know Jeju and its unique history today and into the future.